Comments | [01/12/06] Great book....I took it off the shelf the other night after not looking at it for many years. Wonderful photographs taken in the mid- 1980's with the colorful uniforms of the major league teams as well as old faces of now retired players. Great book Rich! New York | NY | U.S.A. Comments | [10/10/02] I was the photo editor on this book when I worked for The Sporting News. It was one of TSN's first attempts at a photo oriented coffee table book. 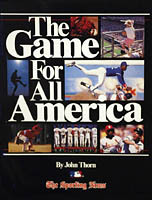 All levels of baseball are featured in the book, from t-ball to the Major Leagues. Although it was a lot of work, I felt very satisified with the fisnished product. This book features outstanding photography by a young V.J. Lovero, Ron Vesely, Andy Bernstein, Louis DeLuca, Al Tielemans, David Madison, John McDonough many many more.